Eternal Haunted Summer: How would you describe your personal spiritual path? Chelsea Luellon Bolton: I am a Follower, or Shemsu, of Aset. I follow the ancient Egyptian Goddess Aset rather than the Greco-Roman Isis of the Classical World. I also honor some other ancient Egyptian deities such as Nebet Het (Nephthys), Wepwawet (Ophois), Ra, Sekhmet-Mut, Nut, and Wesir (Osiris), among others. I’m Kemetic Orthodox and a member of the House of Netjer Temple. The world is made up of Holy Powers and Holy Names and when these resonate with you on a visceral level you know you have found your home. EHS: Congratulations on releasing Lady of Praise, Lady of Power. 🙂 First, why a book about Aset? I have been researching Aset (Isis) since I was in elementary school. After reading about Her for the first time, I was enchanted. She was powerful, regal, magical, cunning, and smart. She was also compassionate and did whatever was necessary to defend and protect those She loved. I really respected and admired all of that. As I kept researching Her, I got into a slump because the books kept repeating themselves and used the same sources over and over again. And I wanted to know what the ancient Egyptian material was instead of the Greek or Roman. I specifically wanted to know what the Ancient Egyptians thought and wrote about their own Goddess. Where were Her Egyptian hymns and attributes? What were Her names, praises and epithets? What were Her holidays? So I searched and I eventually found that information and put this book together to share it with the world. EHS: How did you go about assembling the hymns in the collection? Where did you find them? CLB: So as I was researching Aset, I kept coming across the same hymns and information mentioned in the books I was reading. Most of the hymns cited were from ancient Greek or Roman sources. I knew there were ancient Egyptian temples with hymns inscribed on the walls. Where were Her Egyptian hymns? I never really found any until college when I stumbled across Louis V. Zabkar’s book Hymns to Isis in Her Temple at Philae. There are only eight hymns in that book. I also found Barbara Lesko’s The Great Goddesses of Ancient Egypt. I searched through their bibliographies and found books with hymns from various temples such as Behbeit el Hagar, Esna, and Philae. I also looked for books and articles online. I ordered many of the books through Inter-Library Loan, typed up the hymns in a word document, and started translating them from French and German using various translation programs and dictionaries. I also asked for some help from other people who knew the languages if I got stuck. I also included material from other sources such as The Book of the Dead, various Demotic papyri, and other ancient texts which I had known about from my previous research. I asked Egyptologists (or their publishers) for permission to translate and include the hymns in my book. I also asked Egyptologists (or their publishers) for permission to include their translations of material in my work. You’ll see a list of them in the acknowledgments section. Each hymn has a full citation within footnotes and there is a bibliography in the back of the book. EHS: You published Lady of Praise, Lady of Power through Lulu. Why that site, and would you recommend it to other authors? CLB: I didn’t know much about CreateSpace at the time. I chose Lulu because of my familiarity with it. Would I recommend Lulu? I think Lulu is great as a print-on-demand publisher. I would recommend them. Anyone looking to use Lulu may want to know that they do not have phone support. Their support and help sections are primarily done through chat and email. 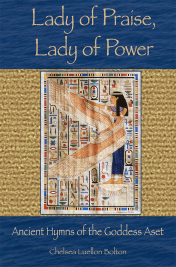 CLB: I am putting together another hymnal for the Goddess called Lady of the Sky: Ancient Hymns of the Goddess Aset from the Temple of Dendera. I am also working on Queen of the Road: Oracles of the Goddess Aset, which is a book of poetry for the Goddess, exploring Her mysteries, attributes, festivals, and more. I am also putting together a Nebet Het (Nephthys) devotional which will include ancient hymns to the Goddess, modern poetry, essays, and oracles. The book is called She Who Speaks Through Silence: A Devotional Anthology for Nebet Het (Nephthys).